« In New York? GRAND OPENING QUIMBY’S BOOKSTORE NYC, 2/4/17! Michael will be joined by musician Sadie Dupuis (Sad13, Speedy Ortiz) who will play a solo set following the reading. Come out for a celebratory lo-fi comics night! Invite your friends to this event with the Facebook invite here! Sticks Angelica is, in her own words, “49 years old. Former: Olympian, poet, scholar, sculptor, minister, activist, Governor General, entrepreneur, line cook, headmistress, Mountie, columnist, libertarian, cellist.” After a high-profile family scandal, Sticks escapes to the woods to live in what would be relative isolation were it not for the many animals that surround and inevitably annoy her. Sticks is an arrogant self-obsessed force who wills herself on the flora and fauna. There is a rabbit named Oatmeal who harbors an unrequited love for her, a pair of kissing geese, a cross-dressing moose absurdly named Lisa Hanawalt. When a reporter named, ahem, Michael DeForge shows up to interview Sticks for his biography on her, she quickly slugs him and buries him up to his neck, immobilizing him. Instead, Sticks narrates her way through the forest, recalling formative incidents from her storied past in what becomes a strange sort of autobiography. Deforge’s witty dialogue and deadpan narration create a bizarre, yet eerily familiar world. Sticks Angelica, Folk Hero plays with autobiography, biography, and hagiography to look at how we build our own sense of self and how others carry on the roles we create for them in our own personal dramas. 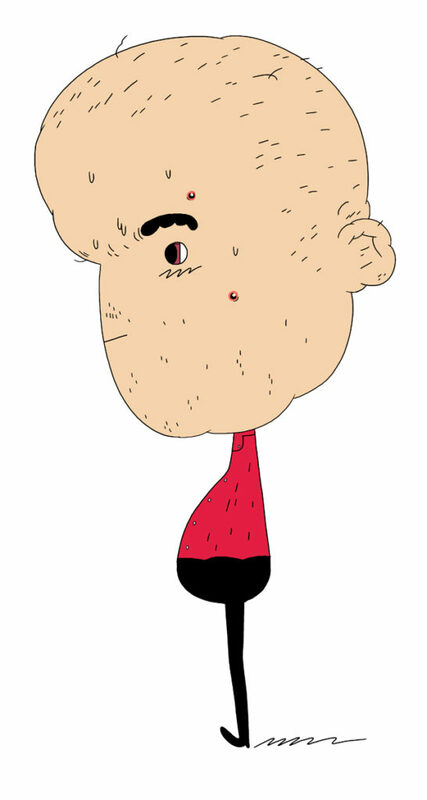 Michael DeForge was born in 1987 and grew up in Ottawa, Ontario. His one-person anthology series Lose has been nominated for, or won, every major comics award including the Ignatz and Eisner awards. His previous graphic novels with Drawn & Quarterly are Ant Colony, Big Kids, and First Year Healthy. 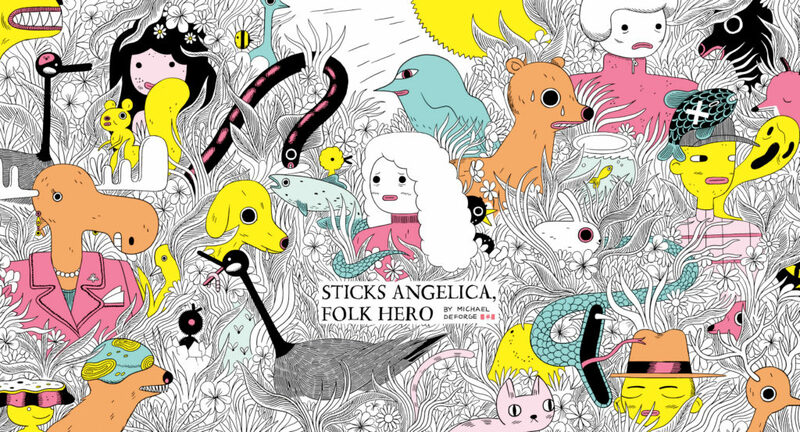 This March he releases Sticks Angelica, Folk Hero. Sadie Dupuis is a musician, writer and artist who most frequently performs as the frontdemon of the rock group Speedy Ortiz, which has released two critically acclaimed albums for Carpark Records. She also writes politically-geared pop songs under the moniker Sad13. Based in Philadelphia, her writing on music has been published in Spin, New York Magazine, and Nylon, and she earned an MFA in poetry from UMass Amherst. 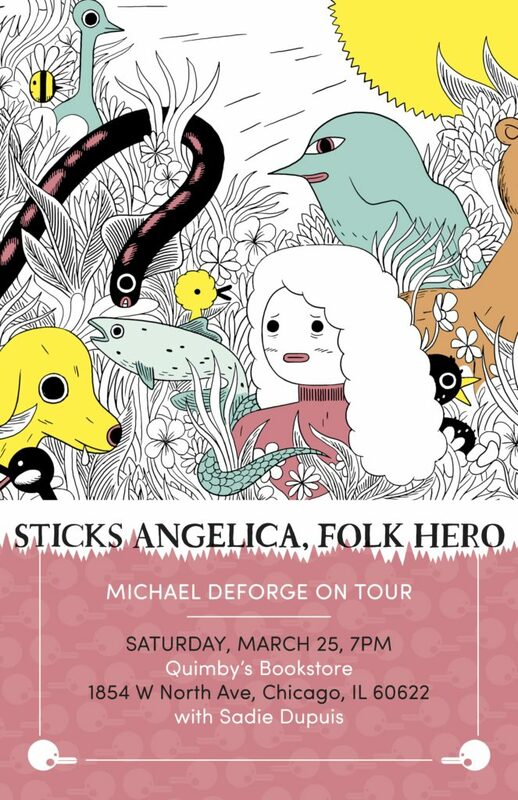 Tags: D+Q, Michael DeForge, Sadie Dupuis, Speedy Ortiz, Sticks Angelica: Folk Hero.